We are all very pleased that Liam received a Special Commendation award in the Individual Achievement Category last Wednesday. He has overcome his learning difficulties and was recognised for his achievements working here with us at PHD. 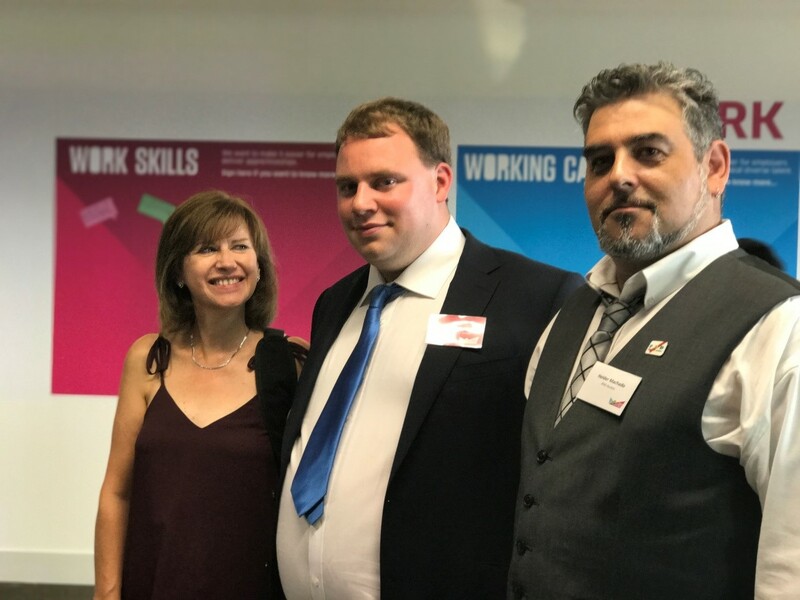 Helder Machado (also pictured) has been such an amazing mentor, supporting Liam by recognising his needs and providing an inclusive work environment. Helder was also short-listed as ‘Mentor of The Year’ at the QEOP Apprenticeship Awards. This was a great way to showcase PHD’s commitment to Equality Diversity and Inclusion. Liam started working with us at PHD in 2014. He began by painting the scaffolding and recycling fittings at our yard. Helder Machado, his manager, noticed that Liam was very persistent due to his autism and liked to finish any work he was given, so he was good at doing his job. When we were awarded the contract at the Olympic Park the increase in work had a positive effect on the business and we looked at up-skilling individuals where necessary to cope with the extra demand on resources. In Liam’s case, we felt confident in training him to do the welding for the guard rails and gates. His attention to detail and concentration is excellent and it wasn’t long before he could continue welding competently in a group without supervision. The increase in responsibility has made Liam proud of his welding achievements and working in small groups has done wonders for his confidence. His Autism means that written communication and social interactions can be difficult and may have been a barrier to employment however by doing manual work in small groups he has overcome these barriers. Liam would travel to the QEOP regularly with his manager to assist in taking measurements and was very pleased to see the rails in place that he had been involved in welding. Liam passed his Health and Safety Test to gain his CSCS card and last year Liam won ‘PHD Employee of the Year’ out of 400 candidates for his excellent attitude to work and for his efforts in supporting the QEOP project. This was an internal award but he is still very proud of this achievement. This year Liam is hoping to get his driving licence which shows how much his confidence has been boosted by the training which was initiated by the project at the QEOP. Liam is now a reliable, competent welder who has never had an accident and doesn’t need to be supervised all the time. The welding training had such a positive impact that Liam has recently completed the Alimak training to do the maintenance for the Hoists and Masts Machines for PHD.